Might this be the Beecher area after the 1953 tornado? There are very few clues. I'd guess that it was in Burton, not Flint. It seems to be on the edge of development. 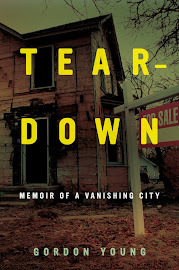 There seem to be gravel streets, straight streets (not curvilinear), houses under construction, and lots of vacant lots. 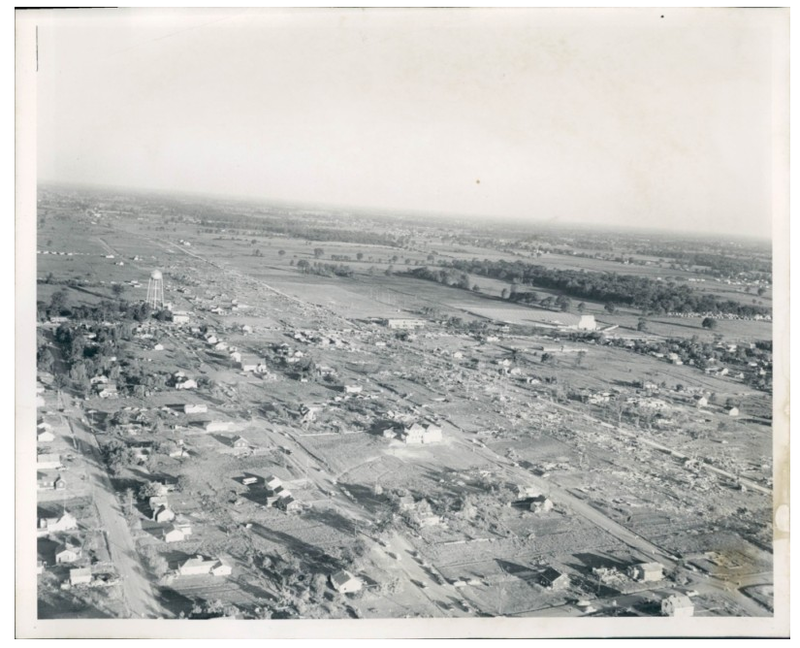 Is that the Beecher area after the 1953 tornado? The water tower would be on Coldwater and going to the right of it is the corner of Saginaw (nw corner) where the new Beecher HS would be built. Check out whatwasthere.com. It was being discussed on the computer show on WJR earlier this evening. There are no Flint Photos there yet. You might want to upload some. Ah, Beecher would make sense. I was struck by how flat the land is. I have a friend who grew up here in San Francisco and he said as a kid he always dreamed of living in a place that was flat with no wind. Maybe kids who grow in places considered highly desirable still dream of getting out. I was thinking Burton too but Beecher makes a lot more sense. There is a very long street there that could be Saginaw. It also appears there is some sort of ball field in the upper right hand corner (I see a scoreboard). Definitely Beecher, looking west. The high school building is at the center of the photo and the drive-in movie theatre, (North Flint Drive-In? ), is just to the right. There is a chilling survivors' story posted on the 50th anniversary Beecher Tornado web site about the mass exodus out of the theatre, when those waiting for the movie to start spotted the approaching wedge funnel. The theatre was spared. Those caught in the resulting traffic jam at Saginaw and Coldwater were not. I remember that night very well. Eerie weather in the evening. I went with my Dad the next day with pass to get in to the area so he could observe the damage to the utility transmission. It demolished Kurtz Ave. I didn't know it at the time, but two kids I went to school with at McKinley who had moved up there, both perished. I think Gary is right about the North Flint drive in theater. I always wondered why the tornado didn't take down the water tower.It went right down Carpenter Rd. heading east. So is the block-wide wrecked streak down the center of the photo, headed west, the tornado track? > Check out whatwasthere.com. It was being discussed on the computer show on WJR earlier this evening. > There are no Flint Photos there yet. You might want to upload some. One uploaded so far. More to come. I saw the destruction in the photo from the ground either the next day or soon thereafter. It was Saturday and I traveled back into Beecher with my Dad on his pass to enter the area and see if the Yankee Store was still standing(I was 7-yrs old). It was just so overwhelming for a little kid's mind to take in, I only remember bits and pieces; but I guess that could be blamed on senior moments too. My strangest memory is that the rear windshield of my dad's "52" chevy was unharmed the night he came home from where it was parked at the Beecher Yankee Store lot as the tornado went over, and then two days after my trip back with him to the area, the glass suddenly went completely opaque with a "godzillion" little cracks and fell out onto the back seat. My dad always thought it must have been due to the tremendous vibrations on the glass that could be felt going through everything and everyone as the loud "freight train -like" wind passed. JWilly, they haven't uploaded any Flint Photos yet. I wonder why.